“Show me the money.” You have heard that phrase, right? Made famous by the 1996 film Jerry Maguire, we have all probably heard it said a thousand times, and yet, the phrase remains just as valid today. Owners of rural businesses are asking the same question because finding capital is a major challenge for those who wish to grow and expand, and Lillian Salerno, USDA’s top business development official, met with various business leaders and owners in the Pacific Northwest to offer assistance on job creation and economic growth efforts. Salerno’s visit is part of the Obama administration’s ongoing efforts to address challenges in rural America, build on the Administration’s rural economic strategy, and improve the implementation of that strategy. During her visit, Salerno discussed USDA programs that provide capital for business growth. 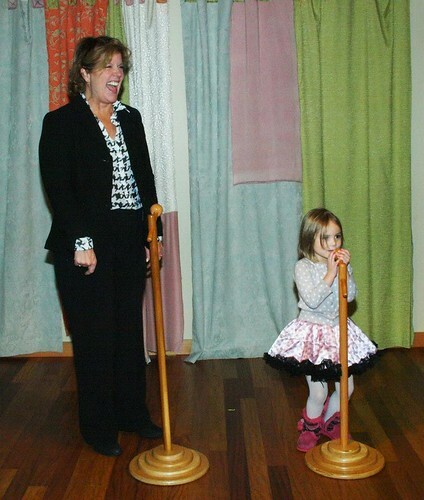 Sing-off between Administrator Salerno and Gabbi at the New Hands on Children’s Museum in Olympia. Photo by Phil Eggman, USDA. On Day One of the Washington State leg of her tour, Salerno visited the Northwest Cooperative Development Center and toured the Hands-On Children’s Museum in Olympia. The museum received a $4 million Business & Industry loan guarantee for leasehold improvements and equipment. Next she participated in a lenders’ roundtable to promote B&I and Rural Energy for America programs and to solicit feedback as to challenges they are facing and product delivery. On Day Two, Salerno participated in a Stronger Economies Together (SET) meeting to report on accomplishments since USDA Rural Development first launched the initiative in partnership with the nations Regional Rural Development Centers (RRDC’s) to encourage the communities and counties in rural America to work collaboratively on a multi-county regional basis in strengthening their regional economies. In the afternoon, Ms. Salerno, along with the state director and area director toured the Lamiglas manufacturing facility, which has been making specialty fishing rods for over 54 years. Lamiglas benefitted from a Business and Industry loan guarantee through the American Recovery and Reinvestment Act. Following the tour she hosted a Small Business Roundtable at the Port of Woodland to gain input from small business owners in Clark and Cowlitz counties. “We want to continue to build on a solid track record of working with local businesses, private lenders and community stakeholders to infuse rural areas with capital resources and technical assistance in support of local business,” said Mario Villanueva, State Director for USDA Rural Development in Washington State, who, along with Business Programs Director Tuana Jones, joined Salerno during the Washington portion of her visit. 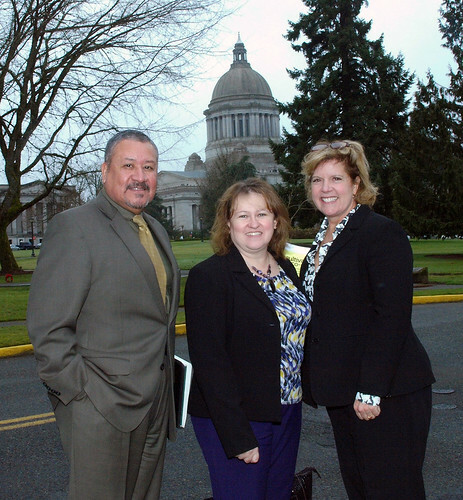 Washington State Director Mario Villanueva, Acting RBS Administrator Lillian Salerno, and Business Program Director Tuana Jones in Olympia, Wash., for a business lender roundtable. Photo by Phil Eggman, USDA. On Day Three of her visit to the Pacific Northwest, Administrator Salerno also met meet with Rural Development staff and program participants in Oregon. Administrator Salerno stopped in the Eola Hills area northwest of Salem, Oregon, to learn how a competitive Value-Added Producer Grant (VAPG) from USDA Rural Development enabled Zena Forest Products to add two full-time employees, tweak internal processes, and double production of sustainable wood flooring in less than a year. At Cherry Country orchard and chocolate factory, the administrator visited with the father-daughter business team that who produces dried fruits, jellies, and candies from the cherries grown and processed at their Willamette Valley farm. Participation through the VAPG program has helped Cherry Country add new product lines with added processing activities and conduct marketing to reach new customers. Cherry Country: Head confectioner, Josefina Tenis, shows the process for making Cherry Country’s signature dried cherries and chocolate to USDA’s Lillian Salerno. Photo by Jill Rees, USDA. The visit concluded with a tour of Left Coast Cellars, a winery that installed two solar arrays with assistance through USDA. The 21 kW ground-mounted solar array provides 100 percent of the power for the winery’s guest cottage, front gate, and estate irrigation needs. The 62 kW roof-mounted solar installation generates the majority of the winery’s other electricity needs. The project has significantly reduced energy costs, along with the carbon footprint of operations.